If you’re looking for a car accident lawyer with experience, expertise, and exceptional client care, trust McGilberry & Shirer with your Dallas car accident claim. Our Dallas car accident attorneys, Steve and Bill, each have over 30 years of experience representing personal injury clients in car accident lawsuits in North Texas. They and their associates have the resources and knowledge necessary to take a car accident claim all the way to the finish line: a settlement or jury verdict for injured victims. A car accident might change your life, but we can, too – for the better. Do You Have a Car Accident Claim? – Call McGilberry & Shirer TODAY! If there’s only one thing you remember to do after a car accident, let it be to call McGilberry & Shirer. We’ll take over every element of your claim, giving you personalized legal care every step of the way. You do not have to worry about a thing or talk to anyone besides your doctors and us. We’ll help you explore your rights and take prompt action toward securing financial compensation for your injuries. Learn more about your legal future during a free, no-obligation consultation with one of our car accident attorneys in Dallas. Call (972) 392-1225 to speak to one of our experienced car accident lawyers in Dallas. Help you in the days and weeks following a crash. Directly after a car accident, you need to gather evidence, seek care for your injuries, talk to insurance agents, and deal with medical bills and lost wages. Feeling overwhelmed? Work with a car accident lawyer in Dallas and suddenly all of these tasks and responsibilities shift to his or her shoulders, not yours. McGilberry & Shirer take care of all aspects of a claim at no extra charge. Give you peace of mind. Our car accident attorneys know how rattling a car accident can be for victims and their loved ones. We strive to bring feelings of calm, confidence, and peace to our clients when we take over claims. Let our team handle virtually everything to do with your case, so you can relax and rest easy in the aftermath of a collision. Explore your rights and legal options. Unless you’re an attorney, you can’t possibly know all the rights you have under federal and Texas state law. It takes years to fully grasp the provisions of car accident personal injury law. Help from Dallas car accident attorneys can open your eyes to the wide range of rights and legal possibilities that could be at your disposal. Take action against negligent parties. If an investigation uncovers that one or more parties were negligent, and this is what caused your car accident, a good lawyer can take immediate action against the at-fault party or parties. There are rules and deadlines you must obey in legal actions that a lawyer can help you easily navigate. Fight for full and fair compensation. Insurance companies will try to convince you to settle your claim as quickly and for as little money as possible. It’s your lawyer’s job to make sure agents and adjusters don’t take advantage of you. Legal representation gives you an edge during settlement negotiations and the ability to take your case to trial if necessary to recover what you deserve. From finding a great healthcare provider who will treat you after a car accident to filing your personal injury claim within Texas’ two-year deadline, a car accident lawyer from McGilberry & Shirer will do it all. Most importantly, the right car wreck attorney will make you feel cared for at a dark time in your life. When you’ve suffered serious injuries, and don’t know where to turn, retain a Dallas car accident attorney. It can make all the difference in your legal experience and in the outcome of your case. After a car accident, you’re probably reeling from the costs of medical care and property damage repairs – not to mention losing your wages from having to take time away from work. The last thing you may want to think about is paying for a car accident attorney. Luckily, you don’t have to. McGilberry & Shirer offers legal services on a contingency-fee basis, meaning you’ll only pay us if we win you a monetary award. If we do win money on your behalf, we take our attorney fees directly out of your settlement or verdict according to a pre-determined commission percentage. That way, you never have to “afford” a car accident lawyer out of pocket. The fee usually comes in around one-third of the compensation award we secure, or 33.33%. However, we may charge more or less, depending on the stage of your case and whether it goes to trial. Initial consultations with our Dallas car accident lawyers are always free and come at no obligation. If you’re worried about what a car accident lawyer might cost, put your fears to rest. Passionate attorneys who truly care about helping people offer competitive pay scales and contingency-fee services to make legal representation affordable for everyone. You don’t have to be rich to hire a lawyer. In fact, a reason to hire a lawyer is because you don’t know how else you’ll pay for your accident-related costs. Discuss your case with our attorneys for more specific information about what our services will cost. Is Hiring a Lawyer Worth the Expense? We get this question a lot, and can’t stress the answer enough: yes. Hiring a car accident lawyer is absolutely worth giving up a small percentage of your settlement or verdict, especially if you’ve sustained serious or permanent injuries. Here’s why – you can’t achieve the results a lawyer can on your own. Most insurance companies immediately offer higher settlements when they find out claimants have hired attorneys because they know this means the claimant has the power to take the case to trial. Trials are expensive for defendants. They will generally do anything they can to avoid a court battle, including upping their settlement offers. If the case does require a trial, your car accident attorney can achieve greater results than you likely can alone. Instead of settling for thousands, you could receive millions based on your damages. A lawyer can do an excellent job of demonstrating your losses and proving the defendant’s negligence and fault – two things that can increase your compensation amount. During a car accident trial, it is the jury that will decide upon the amount of your pain and suffering damages. Texas does not have a cap on the amount you can receive in the form of non-economic car accident damages. This means the limit is as high as your lawyer can achieve. Having an experienced professional who can paint a picture of how the car accident affected you can make a big difference in the amount of pain and suffering a jury decides to award. Even after subtracting the attorney’s fees, you can take home much more than you would have alone. Did You Know the Defendant Could Pay Your Legal Fees? Many Texas car accident lawsuits result in the courts ordering the at-fault driver or other defendant to pay for the victims’ legal fees and court costs. Since you wouldn’t have had these charges were it not for the defendant’s negligence, a judge may see it as fair that you receive these costs back as part of your settlement or judgment. The odds are high that the defendant could pay for your lawyer for you, especially if you have an attorney arguing for this compensation on your behalf. Contact us for more information about the cost of your case. The value of your car accident claim will depend on several factors. You have the potential to reclaim several different types of damages, including economic and non-economic. The value of your existing medical bills, lost wages, pain, and suffering, and other factors will play a role in determining your compensation amount, as well as any future damages you may suffer because of your injuries. State laws can also contribute to your potential recovery. Texas operates as a comparative negligence state, which means the amount you are at fault for your accident will reduce your total compensation value. Even where you go to trial can impact the worth of your case due to the habits of the judge or jury that decides the verdict in your case. In the end, the defendant’s car insurance policy may impact what monetary amounts you can reasonably recover, even with a favorable verdict. When the other party only meets the state minimum requirements for insurance, it can lead to a lower compensation amount than otherwise. If someone doesn’t meet the state insurance requirements, you may then have to pursue an uninsured or underinsured motorist claim. At McGilberry & Shirer, LLP, our Dallas car wreck attorneys always work to help you achieve the maximum level of your rightful compensation by evaluating your case, determining liability, negotiating with insurance companies, and defending your rights in court if necessary. Right after a crash, the law mandates that you or someone else report the incident to police if it caused injuries, death, or more than $1,000 in property damage. This is the case for most moderate to severe accidents. Remain on the scene; leaving before it’s okay to do so is a criminal hit-and-run offense. All drivers in Texas must maintain at least the minimum amounts of insurance coverage. Exchange insurance information with the other driver at the scene of the accident. Texas is a “fault” car insurance state, meaning you will need to prove the other driver’s fault to recover damages. Texas is also a “modified comparative negligence” jurisdiction. This means that two or more parties can share fault for a crash, and the parties may still be eligible for recovery. As long as the courts find you 50% or less at fault for the crash, you could still take home at least partial compensation. In Texas, you have two years from the date your car accident occurred to file a personal injury claim. This is a strict “statute of limitations,” or deadline, that you must not miss. Failing to meet this time limit almost always means losing your right to recover damages. A two-year deadline also applies to property-damage-only claims and wrongful death car accident claims. Do not wait to talk to our lawyers – do so as soon as possible after the crash to make sure you don’t miss an important deadline. Back and spine injuries. Damage to the spinal cord can permanently interrupt the signals between the brain and body, causing loss of function and sensation in the body. Even less serious back injuries, such as herniated disks, can result in a great amount of pain – often chronic pain that lasts a lifetime. Our Dallas spinal injury lawyers can help you get to file a case against a person for your injuries. Neck injuries. Whiplash is one of the most well-known car accident injuries. Whiplash describes injuries to the neck muscles and ligaments from the head and neck whipping around suddenly. Even a “minor” collision like a slow-moving rear-end collision can result in whiplash. Whiplash typically isn’t permanent, but it can be painful and temporarily disabling. Broken Bones. Bones can only withstand so much pressure before they break. Bone fractures are common when the limbs or skull strike objects in the vehicle in a collision. Even the force from the seatbelt can fracture bones in the chest and pelvis. Broken bones can require casts, rest, and hiatuses from work. Head and brain injuries. Striking the head against the steering wheel, windows, or fellow passengers can cause traumatic brain injuries. Brain injuries can range from minor concussions to catastrophic trauma and permanent brain damage. According to brain injury lawyers in Dallas, skull fractures, concussions, and swelling or bleeding in the brain are all possibilities in a car accident. Just because your car accident injuries are “common” does not make them average or unimportant. All injuries are serious to those suffering through them. Regardless of whether you see your injury on this list, you deserve to explore your rights and to take legal action against a negligent or distracted driver. McGilberry & Shirer has experience representing clients with a wide variety of car accident injuries. We can help you find a healthcare provider to address your injuries, keep track of your medical documents, and negotiate with insurance companies for compensation for medical bills, physical pain, and emotional suffering. Highway conditions directly impact the way drivers navigate the road and are often a factor in car accidents. Here are some examples of the most common environmental factors that cause accidents. Glare from bright sun, particularly at sunset, commonly contributes to accidents. View obstructions, such as untrimmed trees, commonly contribute to accidents. Highway road conditions, such as snow, freezing rain, sleet, freezing fog, and black ice commonly contribute to accidents. View obstructions due mainly to fog or rainy conditions commonly contribute to accidents. Other types of severe weather, such as high winds, tornados, or hurricanes contribute to highway accidents. Poor road design or poor road maintenance commonly contribute to accidents. All these factors and many more contribute to accidents every day in the U.S. Of these common contributing factors, slick roads and glare make up most of these accidents. Consider these best tips for handling the two most dangerous issues. To combat slick driving conditions, experts recommend slowing down by about ten miles per hour and increasing following distance slightly. In addition, exercise caution when braking. It is difficult to stop on slick roads, and it can be difficult to know how far a slide will go. Running off the road or rear-ending someone often causes a chain reaction, which creates a worse accident involving more people. However, if a slick road is actually icy, it may be best to stay home and not attempt to drive. Most local governments will de-ice roads with dirt or salt, so wait until that happens before driving. If driving is a necessity, drivers should navigate the roads expecting other cars to not brake as usual. They should also drive with the expectation that roads will be hazardous. Likewise, be wary of driving in flooding rain because cars can easily hydroplane, causing the driver to lose control of the wheel. Any weather situation can make driving hazardous. Even when drivers are accustomed to navigating vehicles in snow or ice, other drivers aren’t – and they can cause accidents. If someone is driving on ice or in a flood and feels uncomfortable, then it might be best to pull over until conditions change. Glare happens because of extremely bright sun, such as at sunset or sunrise. In fact, sunset (the golden hour) is the most danger time of day to drive. Oncoming headlights also create blinding glare. During the worst times of glare, increase following distance and avoid passing and merging when possible. If oncoming headlights create blinding glare, try focusing on the white line until the car passes. This prevents swerving across the middle line, which often results in head-on collisions. Unfortunately, if a city or state does not care for its roads, those highways may be dangerous, even in the best conditions. Potholes, unclear signage, or other issues can cause devastating collisions. While some environmental factors are in your control – how to brake on ice, whether to invest in snow tires, or how to navigate wet roads – managing poor roads is not. Environmental factors such as weather, road conditions, road maintenance, and driver visibility make a significant impact on crash safety and crash statistics. Additionally, they have a huge impact on the outcomes of crash investigations as it pertains to legal disputes about accidents. Find more information from the NHTSA about crash statistics and safe driving. In 2016, there were 35,433 reported car crashes in the city of Dallas. These accidents resulted in 5,296 non-incapacitating injuries, 1,137 incapacitating injuries, and 192 deaths. The most common causes of car accidents in Dallas are speeding, distracted driving, tailgating, and failure to yield the right-of-way. Bumper-to-bumper traffic on Dallas highways contributes to rear-end collisions, but 51.47% of traffic-related deaths occurred on Texas’ rural roads. A total of 3,773 people died in vehicle accidents throughout the state of Texas in 2016. This was a 5.45% increase from the previous year. Car crashes in Texas also resulted in serious injuries for 17,582 people in 2016. The chart above compares the car accident deaths in recent years. according to the Texas Department of Transporation, from 2003 to 2017, the average amount of motor vehicle deaths in Texas is 3510 deaths. 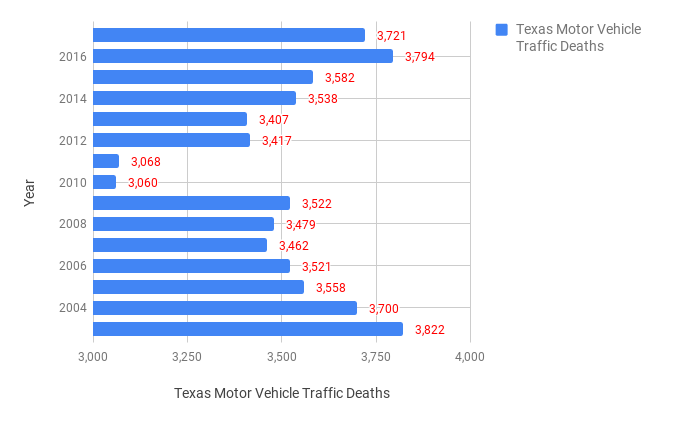 There were no deathless days on Texas’ roads in 2016. If you or someone you love was one of the victims involved in these most recent statistics, you’re not alone. There are attorneys available to assist you with the personal injury claims process. Whether you need help negotiating with another driver’s insurance company or seeking damages for the death of a family member, our team is here for you.